Are you looking for drying books? We offer high-quality drying books from Lighthouse / Leuchtturm, find them here. Why buy kiloware? What is the origin of these stamp mixtures? If you collect used and cancelled stamps you can save a lot of money by washing off the stamps yourself. 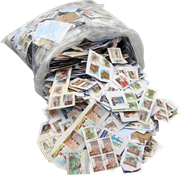 Kiloware or stamp mixtures are unsorted clippings from letters and packages full of surprises – and great value. 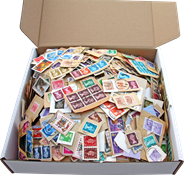 You can spend hours sorting our kiloware and find interesting stamps at a fraction of the price. We offer mixtures from all over the world; USA, Germany, Japan, Great Britain, Australia, France and much more. See our worldwide kiloware here – Many customers reorder this kiloware, which tells us that the content is excellent. The stamp mixtures come from collections all over the word. 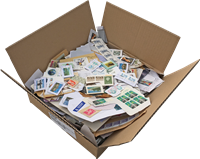 A large share of them are collected by charities that collect stamps and clippings and sell them to stamp dealers like us. Mission kiloware or mission mixtures are kiloware produced by charities, churches etc., where volunteers collect stamps and sell them to dealers. Over the years, we have established a great network of high-quality kiloware suppliers, which is how we have access to stamp mixtures from all over the world. The content of each mixture varies and therefore it is worthwhile to buy two of the same item. In 2001, the English charity organization “Health Unlimited” collected used stamps in collaboration with the popular children's program "Blue Peter". The children were asked to collect 200 stamps and send them in an envelope to “Blue Peter”. The first target was 100,000 envelopes, but before the collection ended, there were more than 1 million envelopes. Nordfrim had previously promised to purchase everything that was collected. We expected about 25 tons, but ended up with 100 tons! The many stamps were collected for the benefit of a project in Peru, where “Health Unlimited” built health clinics for the local population, which has been deprived of access to medical care. The goal was to build three clinics, but ended up with 10 clinics. The private organization "Guide Dogs for Blinds" is available in several countries. They also collect stamps for the benefit of guide dogs for the blind. When you get a bunch of stamps, they are most often stuck to an envelope. When the stamps are removed from the envelope it is called “washing” off the stamps. The stamps should be sorted, before they are washed. 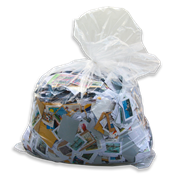 Throw out any stamps that are torn or missing perforations. Now take a look at the paper color of the envelopes the stamps are on. Stamps on paper with strong colors e.g. red or blue should be washed separately. The color could leach into the water and ruin all of the stamps. Discolored stamps have no value to collectors.